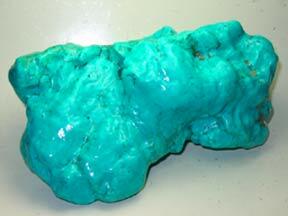 Turquoise is a very valuable ornamental stone. Inferior stones are often colored artifically or “improved” with oil, wax or plastics. Turquoise is a secondary mineral, forming veins in alumina-rich rocks in desert regions. This stone appears to be almost invariably a mineral of arid climates. It is commonly found where rocks have been deeply altered, usually forming veins in broken igneous rocks rich in apatite and chalcopyrite, together with feldspar and copper. Turquoise is rarely found in prismatic crystals. It usually occurs in sky-blue to greenish-blue microcrystaline masses, nodules and veins, sometimes filling cavities in surrounding rocks. The only crystallized occurrence was found in Virginia in the form of druses of small short prismatic rosettes. It has a hardness of 5–6. Turquoise is light and brittle (fragile), with a smooth conchoidal fracture. It has a waxy or porcelaneous luster, translucent only in thin sections. Turquoise, with a brown to white matrix, can be found in New Mexico, Nevada and Arizona in the US. It is also found with a black matrix, which is the more highly regarded, in Tibet and Iran. Turquoise also occurs in Egypt, Chili, France and Turkestan. Turquoise is a profound master healer. It strengthens the entire anatomy and eases all diseases and miasms. Nutrients are better absorbed, and all the chakras, meridians, nadis and subtle bodies are strengthened and aligned. Additionally, general tissue regeneration is stimulated as it increases circulatory flows to the muscular tissue, especially when there are torn tendons or ligaments. Turquoise is also a powerful protector against all environmental pollutants, especially background cosmic radiation (good for people living in high altitudes).